This is a ValCo bulk storage bin. 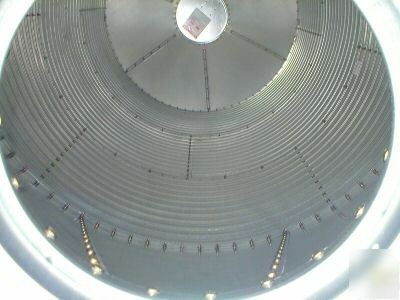 It will hold 5.58 tons or 224 bushels and stands aprox. 16 feet and is 6' in diameter. It's weather tight die formed roof has reinforcing ribs at the seams for added strength. 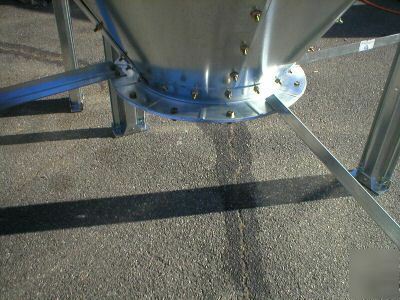 Bin bolts have a built-in weather seal and a drip edge to keep water away from the taper hopper and unloading boot. 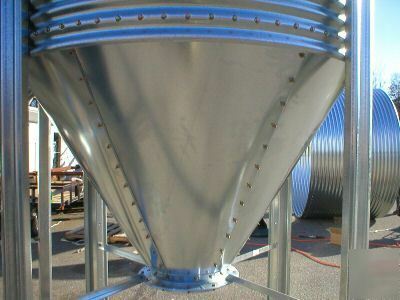 Bins are made of heavy gauge G-90 galvanized steel with 2 2/3" wide by 1/2" deep corrugation. Legs are die formed with a sturdy bracing system for structural support. 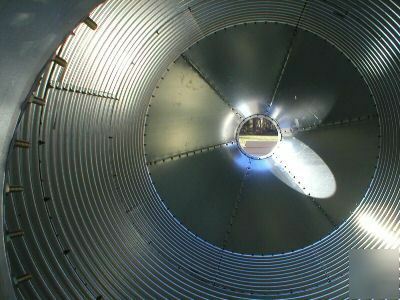 Note: All feed bins are designed for the storage of free-flowing material only. Soybean meal, meat scraps and certain other materials are not considered to be free-flowing and should not be stored in these bins. Bin is being sold unassembled. Freight is not included in price. Delivery available, contact us for quote. Item is being sold with a manufacturer warranty of one year. No returns are allowed unless otherwise specified.